My research positions me well to address course topics across a geographical and chronological breadth, with a focus on the eastern Mediterranean in the common era but not limited to those parameters. 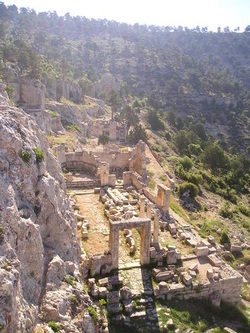 I have relied on case studies and comparative material from across the eastern Mediterranean, from Greece to Jordan, with a focus on Anatolia, from Ephesos to Silifke to the northern edge of the central plateau, and am thus equipped to teach various introductory level surveys, as well as more specialized courses on subjects ranging from the Archaeology of Pilgrimage to Monastic Archaeology to 'The Other Wonders of the Ancient World: Technology and Engineering'. I rely heavily on archaeological and anthropological theory in shaping my research questions and methodologies, and thus can teach general courses on archaeological theory or specific theoretical and methodological approaches, such as place theory or survey archaeology. My analysis and spatial modeling of travel infrastructure in a Geographic Information Systems (GIS) environment has prepared me to train students how to use these tools effectively in their own research. In addition to my own research and teaching experience at the undergraduate and graduate level at Florida State University, I have been a teaching assistant for introductory level classes on Food and Drink in Antiquity, Geophysics, Water, Culture & Power, and on the deep history of the city of Istanbul through the Joukowsky Institute for Archaeology and the Ancient World, all of which I would be comfortable developing as my own courses (some of these form the basis of syllabi I have already developed in detail, found under the Course Syllabi menu). I have outlined my teaching interests below.